It’s New Moon on September 1 (and an annular solar eclipse, which looks like a ring of fire) at 9 degrees of Virgo. You’ll feel this eclipse most strongly if you have planets or angles at 8 to 10 degrees of Gemini, Virgo, Sagittarius, or Pisces, or if you’re born between May 29 and June 3, August 28 and September 3, November 29 and December 3 or February 29 and March 3. This is because Saturn and Mars are together in the sky at the moment at 10 and 14 degrees of Sagittarius, and Neptune is at 10 Pisces. 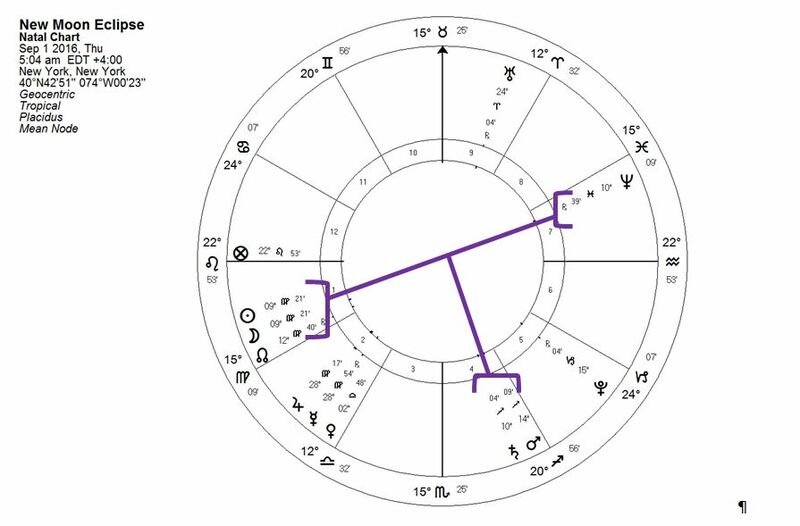 The New Moon (together with the Nodes) therefore creates a strong T-square pattern with Mars, Saturn and Neptune, which is not to be underestimated! Stay quiet and focused while you go about your business. The second part of the week will bring much to light for all of us. Full Moon is on Friday, September 16, at 24 Pisces.